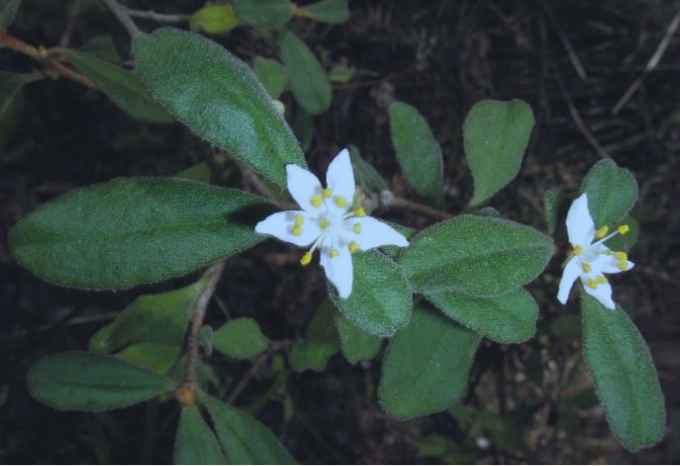 Asterolasia species is known as the Dungowan Star Bush and is a very rare plant from an area near Tamworth, New South Wales and is a member of the Rutaceae family. The Dungowan Star Bush is an erect shrub, reaching a height of two metres. The leaves are oblong in shape tapering to the petiole. The upper surface is green whilst the lower surface is paler green to fawn. The white flowers are solitary, carried in the leaf axils and appear in spring. Foliage and flowers are similar in appearance to Correa alba. Growth habit, foliage and flowers are attractive features. In our cold climate garden this species has proved to be drought and frost tolerant. Asterolasia sp could be grown as a foreground shrub in native garden beds. Perhaps three could be grown close together to form a specimen clump in the smaller garden. For those with balconies, Asterolasia sp would adapt satisfactorily to life in a container. Although extremely rare, in nature, the Dungowan Star Bush propagates rapidly and enthusiastically from cutting. Root production is as fast as the Correas, its close relatives. As far as we know the existing populations are not protected in any reserves. The more gardeners that grow this rare and beautiful shrub will increase its chance of survival. We have thought that perhaps Tamworth Regional Council could adopt the Dungowan Star Bush as the Council’s floral emblem. The wild population occurs in the Council area. 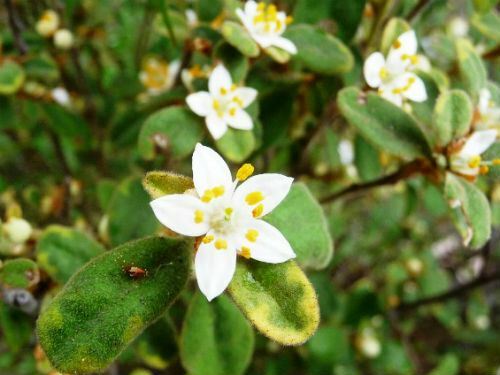 The plant has some similarities to Asterolasia correifolia and Asterolasia hexapetala (from the Warrumbungles). It now has the name Asterolasia beckersii Orme & Duretto following the paper by Orme and Duretto in the journal Telopea (vol 20, pages 165-169, 12th July 2017). The plant is an upright shrub to three metres. The stems tend to be covered in a rusty brown indumentum. The leaves have a short petiole and an elliptic lamina. The inflorescence is a terminal umbel of 1-3 flowers coloured white. It is known from three populations in the Nundle to Nowendoc area SE of Tamworth. The name honours Doug Beckers for discovering the plant. Fortunately it is in cultivation already with many of us growing it. Like many of the Asterolasias that tend to inhabit creek banks, it likes water.